Wrap up tight, there's a helluva storm brewing up outside. With wind blowing so hard the windows are rattling, and lightening crashing around whilst spooky tones enter the fold, this slot will have you hiding under the covers if you play it at dark! As the clock strikes midnight, the ghouls and ghosts of the graveyard come out to play. 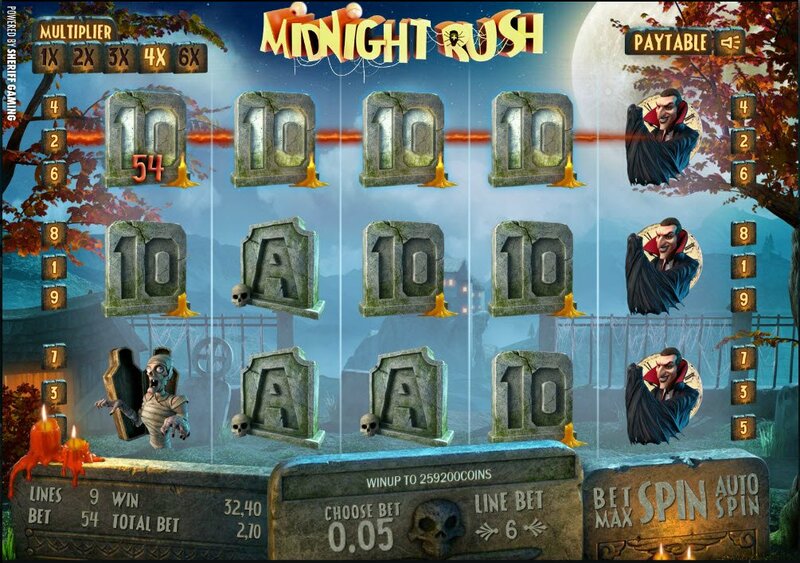 The Midnight Rush 3D slot game will have you spinning those 5 reels in trepidation, fearfully looking out for how many of the 9-paylines you can score as the thudding of the creaky old reels inching their way round and sounding like tombstones cracking rings heavy in your ears. 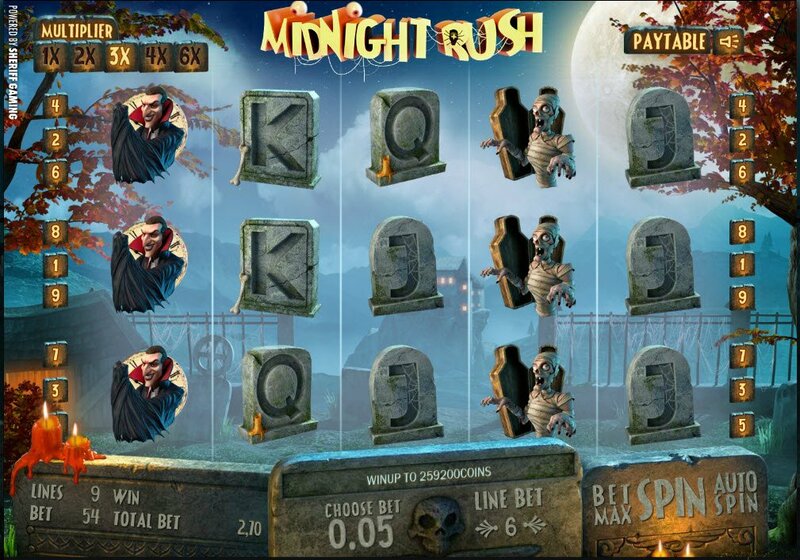 In reality, gameplay with the Midnight Rush slot is animated to perfection, with the music chilling you to your spine, putting you in the mood for what is to come. The owl tweeting makes you feel sorry that it must be out there alone, to face the dangers of the characters in this slot. As with all Sheriff Gaming slots; features are spectacular to see and innovative to boot. There is Count Dracula, skeletons coming out the closet, mummies and all sorts of other graveyard regulars. 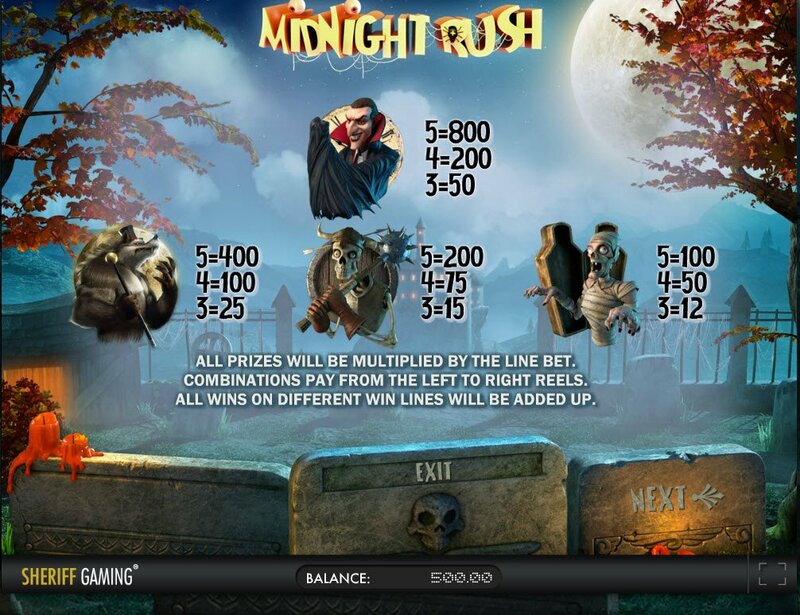 The Midnight Rush slot multiplier feature is randomly awarded at the beginning of each spin, and will calculate how much more you will get on a winning spin. As the clock strikes midnight, the ghouls and ghosts of the graveyard come out to play. The wilds are expanding and increase your chances of winning paylines when you spin them into play. There's a fresh new style feature, the Click Me symbol that you can find anywhere on the reels and will start the Midnight Rush slot bonus game. Different prizes are hidden and you can collect them by clicking "Click Me" as often as you see it, right up until the word "Collect" becomes visible and the bonus game ends.